Teenager faces her fears, finds her "Destiny"
Marlyn felt another anxiety attack coming on. Her hands were becoming numb. Her heart was racing. And now she was struggling to breathe. Her worst fear had come true: she was pregnant. "I can't let my mom know," she told herself. "She will kill me if she finds out I'm pregnant!" Marlyn talked to some friends at school about her predicament, and they said that they would help her get an abortion. The girls traveled from the small desert town of Mojave, an hour's drive to the Bakersfield Family Planning Associates abortion facility. When they arrived at the FPA abortion chamber, they noticed a "free pregnancy test" banner outside the LifeHouse pregnancy help center across the street. Marlyn was still early for her appointment, so she decided to go to the LifeHouse, hoping that maybe she wasn't really pregnant. At the LifeHouse, Amy and Terri Palmquist provided Marlyn with the test, and offered to show her a six-minute video about abortion. But Marlyn's friends laughed and said she didn't need to see it. "God has a plan for you and for your baby," Terri told Marlyn, but it seemed that she wasn't listening. When she saw that the pregnancy test was positive, Marlyn hurried across the street to the FPA abortion center. But during her examination at FPA, Marlyn was told that she had a tubal pregnancy and she needed to come back in two weeks. On her way out of FPA, she shared her situation with Terri. "If the baby is really in your tube, they can't deal with that here," Terri warned Marlyn. "You need to get to a hospital right away, because you could die if the tube ruptures." Having experienced numerous instances of bogus information being provided to women by pro-abortion medical personnel over the past two decades, Terri thought Marlyn should get a second opinion. Terri brought Marlyn to the Bakersfield Pregnancy Center for an ultrasound. The BPC ultrasound technician said that she couldn't find the baby, so it was possible that it was in her tubes. Terri encouraged Marlyn to go home immediately and tell her parents to get her to a hospital. Marlyn realized that she needed to face her fears. When she told her mother, Marlyn's anxiety attack became so severe that she fainted. "She didn't get mad at me because I was pregnant," Marlyn recalled. "She just got mad because I was going to get the abortion. She is against that!" Read more about how God saved Destiny from abortion in our Weekly Ministry Focus Volume 3 Number 14 (we originally gave Marlyn the nickname "Menita" for this report). Marlyn's mother rushed her to a hospital in Lancaster, where an examination revealed that her pregnancy was normal. "We were so happy," Marlyn recalled, "that we went right out to a store to buy baby clothes." Marlyn picked up some "Precious Moments" items as she began to have happy thoughts of the tiny child in her womb. Thoughts of abortion had vanished from her mind. Several months later, Marlyn's obstetrician brought her bad news. "There is a cyst on your baby's head, and brain tissue is coming out," he said. "There's no hope." Marlyn called Terri on the phone, crying "the doctor says I should abort the baby. I don't want to, but I don't know what else to do! He says that the baby isn't going to make it, and that if it survives it will be a vegetable." Terri comforted Marlyn and encouraged her to trust in God even though things looked impossible. Years earlier, Terri had helped another woman who had been scared by this same doctor into almost aborting her baby. So Terri urged Marlyn to find a second opinion from the best doctor possible. At UCLA, a doctor gave Marlyn the hope she was looking for. He said that although the baby had a cyst, a surgery could be performed after birth to correct the problem. As the end of her pregnancy approached, Marlyn's brother encouraged her to name the baby "Destiny Lucky," because the obstacles she had already overcome indicated that God had a great plan for this baby's life. Destiny Lucky survived her birth, but she did have a large bump on the back of her head. The bump was covered with a hat for a few days, until several surgeries could be performed. The procedures left baby Destiny with a shunt, to help drain the excess brain fluid. Destiny continued to experience serious health problems, but she was definitely not a "vegetable." "...Perfect love casts out fear..."
After baby Destiny came home from the hospital Terri Palmquist and her husband Tim encouraged Marlyn to bring the baby to the "Healing Rooms" at a church in nearby California City for prayer. But Destiny was not allowed out of the home because the risk of infection was too high. So Terri and Tim brought a baby blanket to the healing rooms to be prayed over on Destiny's behalf. But during the prayer time, the intercessors focused more on Marlyn than Destiny. They had no way of knowing it, but at that very moment Marlyn's stress over baby Destiny's condition caused her to suffer a severe anxiety attack. She was being rushed to the hospital in an ambulance, apparently at the very moment that the intercessors gathered to pray for her. Suddenly, her anxiety attack was gone. Later that evening, Terri and Tim presented Marlyn with the baby blanket and prayed over Destiny and Marlyn. Over two years after she had been offered the opportunity to watch a video about abortion at the LifeHouse, Marlyn asked Terri and Tim if they would show her the video. With little Destiny happily running around the room, Marlyn watched in horror as she saw what could have happened to herself and her precious daughter. "If I had watched that video the first time you suggested it, I would never have considered abortion," Marlyn confessed. Today, Destiny is a happy and healthy toddler, living with her parents in Mojave. 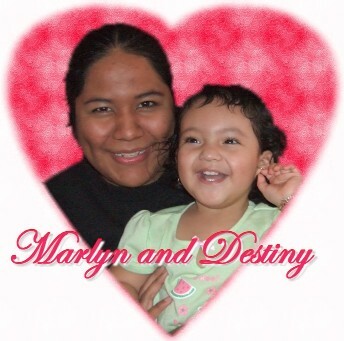 God has provided a good job for Destiny's father, so that Marlyn can stay home to care for Destiny. Marlyn's family is also nearby to help. "Only God knows what lies ahead for Destiny, but already at her young age she represents a great victory against the devil," Tim commented. "The devil wanted to trap Marlyn into killing Destiny just so that Marlyn would not need to admit her sin to her mother. But when Marlyn confessed her sin to her mother, she became a great help to Marlyn throughout the difficulties she would experience. "Marlyn's story represents a great example of what God wants to do in our lives if we will simply confess our sins and come to Jesus in repentance."